I am very fortunate to have two best friends. Pete Olson and John Porter. I first met both of these guys in 2003. Both began reading my Blog. Thru that Blog connection, friendship blossomed! 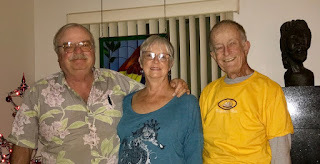 I last met with Pete and his wife Frederika a few days ago during my trip south. I am heading over to see John and his wife Mimi this morning. Note: I've titled this Blog post, "Home." In my mind, San Diego is my home. There is not room enough to carry a full set of golf clubs with the Scampy Team. So, I bought a Divnick, Whole-In-One Club [Link]. John has not seen my new Divnick club. Also, I have never played golf with my Divnick. Good times are coming! My eyeglasses broke last nite. My eyeglasses always break at the hinge. And, every pair of eye glasses that I've ever owned breaks. There's a place in San Diego that specializes in the repair of eye glasses. It only took 20 minutes to do the repair. $31.00 the charge. I love to visit here. I brought Boid in with me. Two budgies live here. They are Buddy and Ollie. And Boid plays with them. All three are loose in a playground fixed up in the kitchen window box. I visited for awhile, and then went off to Postal Annex to rent a mailbox. Very convenient to have my own mailbox when remaining in one place for several months. I rented a Postal Annex box while staying in Beaverton, Oregon. But...... I do carry my clubs. Just that my set of clubs consists of one club! Hi George, I am reading the book Nomadland by Jessica Bruder and on page 85 she mentions you and your website. This was when you had Ms. Tioga and she mentions Mr. Chips and Mr. Sony Mavica, etc. She mentioned how you "influenced a generation of boondocking bloggers." Did you know that you are mentioned in her book? No, I did not know that. I've never heard of, "Nomadland" until I read your comment. You may define your terms as you please, and question whatever you wish, but my experience is this: whenever my wife Frederika and I find ourselves among a group of full-time RVers that we have never before met - such as at Quartzsite - people recognize us because we have been mentioned in George's blog, and a large proportion of them state that his big was very influential in their decision to live and travel in their RVs. 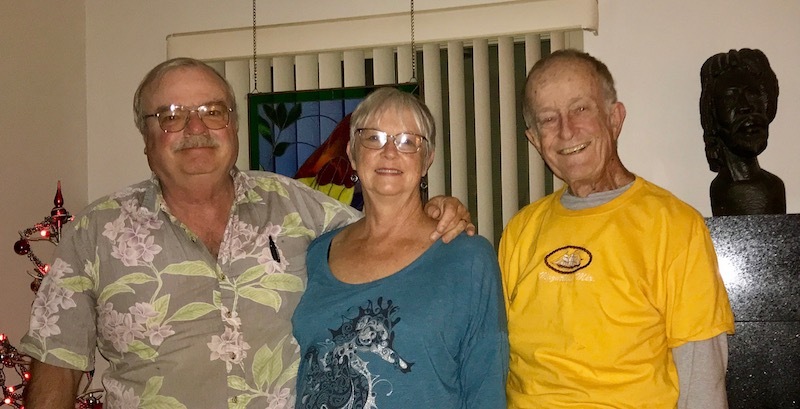 After the accident that destroyed Ms Tioga and landed George in the hospital, he didn't blog much, and every new group of strangers that recognized us from our association with him wanted to know if we had news of him. I have known many famous people in my life, but apparently the one that made ME famous was George...! Thank you, Pete! You are my such a good friend to me. I have written about you many times in my Blog. And of course, the link to your website that has your photo is permanently placed at the top of my Blog. Ed does not understand what happened between me and my fellow RVers. So let me explain. Back in February, 2003 when I first began RVing, there were hardly any RVing Bloggers. The reason for this lack of Bloggers in the RVing world was because Google had only bought Blogger that very same month! My self dedicated mission when I began my Blog in May, 2003, was to be of service to my fellow RVers. I accomplished this mission by answering how-to-do questions on the RV.NET Forum. I was out there RVing all over the Western United States and publishing what I was doing in my Blog. People wanted to be doing what I was doing. And I wrote about my experiences in my Blog. That's the story, Mister Ed. Like it or lump it! But there it is.